The European Union on Thursday announced a support package to support Ethiopia in the area of justice and rule of law. The €10 million package was unveiled after a meeting between Ambassador of the EU to Ethiopia, Johan Borgstam, and Ethiopia’s Chief Justice, Meaza Ashenafi. The two parties also held fruitful discussions on areas of importance and of mutual interest, Meaza Ashenafi said. The Government of Ethiopia has embarked upon a path of political and economic transformation. In addition to measures that build peace with Eritrea, the Government has recently broadened the political space to include opposition parties. 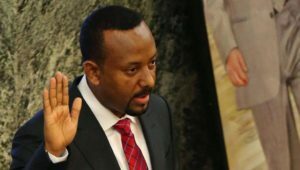 Ethiopia’s government led by Prime Minister Abiy Ahmed has been championing political reforms, reaching out to opposition parties. Abiy has said his ultimate ambition is to organize democratic elections and pledged to conduct a smooth transition if the ruling coalition loses in 2020. The Ethiopian government likewise engaged actively in regional diplomacy, and announced a range of economic reforms designed to revitalize the economy of Africa’s second most populous nation. Ethiopia is among the countries that benefit from the initiative that allows least developed countries to export to EU except armaments duty-free and quota-free.